Love is in the air! This adorable new set from Pink & Main's January release is super sweet and perfect for Valentine's Day, Anniversaries, Engagements and more! For my card, I layered black cardstock on to the card base. I then cut strips of pattern paper from the new Watercolor Foil and Beach Babe pads. 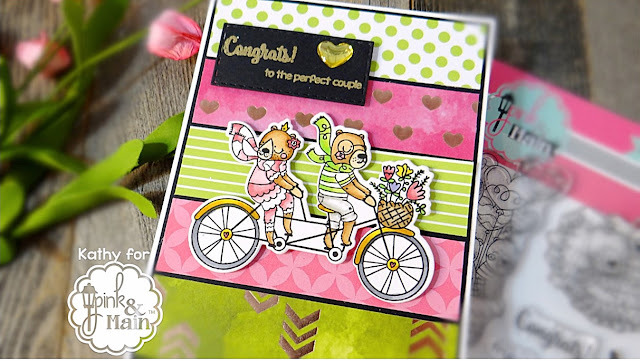 I chose the cute bear couple riding the tandem bike from the Perfect Couple stamp set and coordinating dies to copic color. The sentiment, also in this set, was gold embossed on black cardstock and cut with one of the Stitched Rectangles #2 dies. To finish, I added one of the new Gold Glossy Hearts to embellish. Hope you'll follow Pink & Main via email/blog, Facebook and/or Instagram so you won't miss any projects the design team shares...not to mention, you'll be among the first to hear about deals and specials! Fab card. The image is a great one.